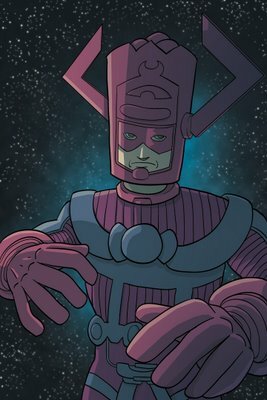 Scott Hallett | Sketchbook: Galactus! "Galactus" was this week's Drawer Geeks topic. The focus on this one was getting a straight up cel shaded effect that I was happy with, and cutting down on my coloring time. I was pretty pleased I was able to get this one out quickly. I realized after finishing this that Galactus' pose is a bit like he's getting ready to scratch some records. Maybe he's a DJ on his off time?